GARIBALDI, Giuseppe (1807-1882) was an Italian general and nationalist. A republican, he contributed to the Italian unification and the creation of the Kingdom of Italy. He is considered one of the greatest generals of modern times and one of Italy's "fathers of the fatherland" along with Camillo Benso, Count of Cavour, Victor Emmanuel II of Italy and Giuseppe Mazzini. Garibaldi is also known as the "Hero of the Two Worlds" because of his military enterprises in Brazil, Uruguay and Europe. He commanded and fought in many military campaigns that led eventually to the Italian unification. In 1848, the provisional government of Milan made Garibaldi a general, and in 1849, the Minister of War promoted him to General of the Roman Republic to lead the Expedition of the Thousand on behalf and with the consent of Victor Emmanuel II. His last military campaign took place during the Franco-Prussian War, as commander of the Army of the Vosges. Autograph Document Signed “G. Garibaldi” 1pp. 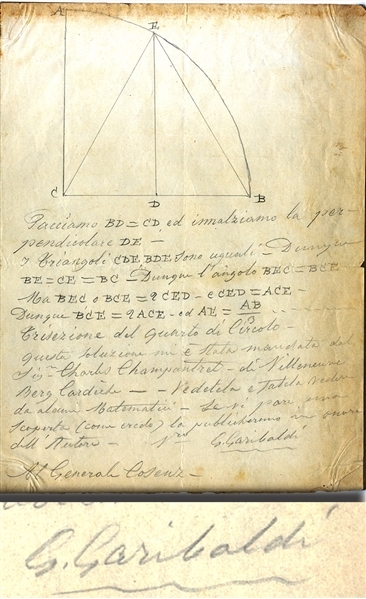 quarto, in Italian and being a mathematical problem addressed to General Coseur. Fine condition.